Dogs don’t live in a protective bubble. They can get ill and injured. A dog can get stung by a bee, cut a paw during a walk or choke on a treat, then collapse and stop breathing. As a master certified pet first aid/CPR instructor and founder of Pet First Aid 4U, I realized that pet parents and pet professionals need not only to learn pet first aid but learn to be adaptable in pet emergencies when minutes do count. That’s why I created a program called “Unleash Your Inner Mutt-gyver.” It is a game plan that gives specific tips and tricks to use when for those times when you do not have a pet first aid kit handy. 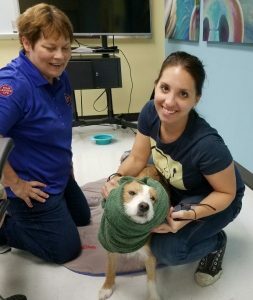 The goal is to use everyday items to stabilize an injured or ill dog until he can be safely transported to the veterinary clinic to receive professional treatment. Download a pet first aid app on your cell phone NOW! Select an app in your country that provides step-by-step pet first aid tips but also shows you the nearest veterinary clinic location. Always alert that clinic while en route and give your estimated time of arrival so the staff can prepare an exam room. Throw on the towel. Or sweatshirt. Or shoelaces, Any dog can bite when in pain so protect yourself by safely restraining an injured dog. Convert a nylon leash into a makeshift restraint muzzle to keep his lower jaw from opening and biting you. For small dogs, you can use the drawstrings from a hooded sweatshirt or your sneaker shoelaces as a temporary muzzle. For dogs with short muzzles like Boxers, Bulldogs and Pugs, you can roll a thick towel lengthwise and around the dog’s neck, gripping the ends behind their heads and lifting slightly to prevent him from opening his mouth. Cool down a hot dog. Excessive panting, sweaty paws and bright red gums are warning signs of a dog becoming overheated and if untreated, suffering from heat stroke. Keep your dog hydrated and cool during outdoor outings by pouring bottled water inside a baseball cap or forming a spare plastic poop bag into a temporary water bowl. You can also place each of the dog’s paws in this cool water one at a time to help combat his rising body temperature. If your dog gets sunburned, never use ice cubes on the burn site because you risk him developing hypothermia and going into shock. Apply cool water. Sock it to those bloody paws. Clean the paw with water from your bottle and then fit the injured paw in a sock. Apply pressure to slow down the bleeding. Secure the sock to the paw by wrapping an unused plastic doggy bag and tying it around the paw. If possible, carry the dog and keep the injured paw above his heart to slow the bleeding. Here is the buzz on bees. For bee or wasp stings, scrape the stinger out using a credit card. Never use tweezers as it can burst the venom sac and spread venom inside your dog. Make aloe as your pal-o. Aloe is Mother Nature’s wound healer. Gel from an aloe plant can temporarily treat wound and insect bites as well as burns and frostbite. However, never apply latex (the white sap) from the aloe plant on a dog because it is toxic. Sniff around for Mutt-gyver items. In a pinch, you can use your bra as a leash to rein in a runaway dog. Tongue depressors, Popsicle sticks and even water bottles can be used as temporary leg splints cushioned by folded newspaper sections or rolled up magazines. A Mylar blanket can be used to warm a cold dog, melt snow to collect rainwater and serve as a sling. Have you used a Mutt-gyver trick when performing first aid on your dog? Please post and share! Arden Moore is The Pet Health and Safety Coach. 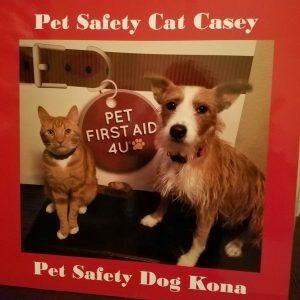 She is a best selling author, host of the weekly Oh Behave Show on Pet Life Radio (www.petliferadio.com) and founder of Pet First Aid 4U, the veterinarian-endorsed, customized program featuring a real cat and dog (Pet Safety Cat Casey and Pet Safety Dog Kona) as teaching assistants. Learn more at www.petfirstaid4u.com. Also, check out Arden on Facebook at www.facebook.com/ardenmoore. cats and dogs, first aid, healthy pets. Bookmark.